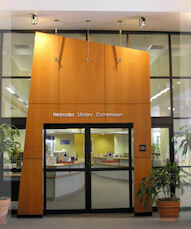 The Nebraska Library Commission is located in downtown Lincoln at 1200 N Street in the Atrium Building. N street is one-way running east to west. The Atrium Building is on the north side of N street. The entrance to the Atrium Building is located under the skywalk. After entering the Atrium Building from N Street the Commission is located to your right. Take exit 401 (9th Street & Downtown). Travel south on 9th Street to O Street (You will need to stay to the left). Turn left (East) onto O and go to 13th Street. Turn right (South) onto 13th and go 1 block. Turn right onto N Street. The entrance to the Atrium Building is half way down the block on your right. Continue on Highway 2 until it turns into 10th Street. Follow 10th Street north into downtown Lincoln. Turn right (East) onto M Street. Go to 14th Street. Turn left (North) onto 14th street. Go two blocks (North) until you reach N Street. Turn left (West) onto N Street. Go 1 1/2 blocks. The entrance to the Atrium Building is half way down the block on your right. The closest parking garage to the Library Commission is the Center Park Garage located at 1120 N Street which is across the street west of the Atrium Building. 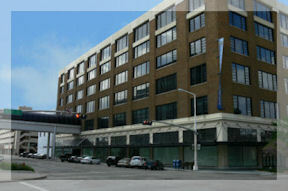 You can enter the parking garage from 11th, 12th or N street. The Downtown Parking map shows the location of all of the parking garages in the downtown area. Two hour meters are available in front of the Atrium Building. The meters cost $1.25 per hour. We are unable to provide change for the meters. Some meters will accept credit cards (VISA or MasterCard only). Parking meters are enforced from 8:00 a.m. to 6:00 p.m. Monday through Saturday. Additional parking information can be found on the Park and Go website.